The Omega enthusiast may know that after production ended on the Seamaster 300 in 1970, Omega’s lineup of diving watches changed dramatically. Gone were the bombe lugs and family resemblance to the Speedmaster. In it’s place, there were a bunch of chunky, colorful divers. In the middle 1970’s, the diving enthusiast could get a Seamaster 120 and 120 chronograph, two 200’s, the Seamaster 600 “Ploprof” and the Seamaster 1000. This article will concentrate on the Seamaster 200 “SHOM.” These watches are plentiful on the market and usually in excellent condition. The Seamaster 200 range consisted of the 166.068 in “Banana” and “Poppy” colorways and the 166.091 “pilot line”. As the story goes, the Service Hydrographique et Océanographique de la Marine or SHOM, did not like the available options and commissioned Omega to build a 4th watch, the 166.177. The SHOM was a French government agency that produced maps and charts for divers. These cartographers got an interesting angular case with the black plongeur sword hands and dial from the pilot line 200m. I have seen many of these SHOM’s come up for sale in standard and left hand crown configurations. Nearly all of these were made by Watchco, an Australian Omega parts and service center. They use vintage Omega movements from lesser models and the rest of the watch is put together from brand new parts in the Omega catalog. While they are not true vintage Omegas, in the sense that they were not around in the 1970’s, these Watchco specials have value in the marketplace and are fine to trade if you disclose the parentage. Everything else on the market is a Watchco. Watchcos are marked by pristine cases, mint luminova dials that glow like torches and aluminum insert bezels. They were made with the correct black hour and minute hand, as well as the orange handset from the Seamaster 120 “baby ploprof,” Many times they come on a new-old-stock mesh bracelet and some of them are left handed. This is purely a way of making a rare edition by putting the watch together in a non standard way. Left handed SHOM’s and Ploprofs are made by people not assembling these watches correctly and claiming they are special editions. 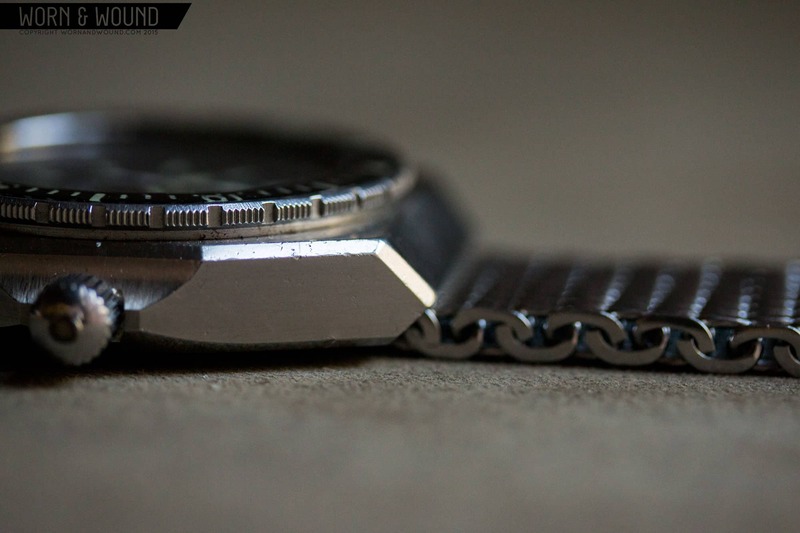 Fear not, because you can flip the movement and make it a proper watch. The inner caseback will either have an LL or CB hallmark, but not the Piquerez diving helmet. The SHOM is a neat looking watch, with an angular, beveled case that was quite different from the rounded cushion cases popular in the 1970’s. They come with the 1012 and 1002 flat rotor Omega movement, which is a nice piece of machinery with a quickset date. So now that you are an expert on telling an authentic 1970’s Omega SHOM from a new Omega SHOM made from new parts sold by Omega, should you care? Both models are worth roughly the same at around $2500. The market doesn’t seem to care and I think the NOS case looks stunning with its laser sharp lines and perfect brushing. The sentiment goes something like this. You’re buying the watch to wear and not collect and you like the NOS look. If that’s you, go for the Watchco. This being said, I wouldn’t put one into my collection, because I value authenticity and originality. For that money, I like the look of a watch that has led a life, complete with some patina. These new versions look a bit antiseptic to me. The shiny aluminum bezel also kills it. Every other Omega 70’s diver has an acrylic bezel, which is a lost art. So, if you’re also a purist, happy hunting for a real SHOM. Send me a picture if you get one.